For over 14 years, our ophthalmology practice has provided vision treatment such as LASIK and PRK at offices in St. Croix and St. Thomas, USVI. From custom LASIK to intraocular lenses and much more, Drs. Byron and Keri Biscoe provide comprehensive treatment for conditions ranging from nearsightedness and farsightedness to cataracts, glaucoma, and diabetic retinopathy. Their expert care has helped many to experience better vision and a better quality of life. Whether you are considering advanced surface ablation or you are interested in having a regular eye exam or new glasses, our entire staff looks forward to meeting your vision needs. For some patients with damaged or diseased corneas, the best treatment option may be corneal transplant surgery. In this procedure, the patient's cornea is replaced with a new cornea from a recently deceased donor. Corneal transplant is a safe, effective procedure. The National Keratoconus Foundation estimates that corneal transplant surgery restores eyesight to over 40, 000 Americans each year. Dr. Biscoe will discuss all aspects of treatment with you, including recovery and risks. 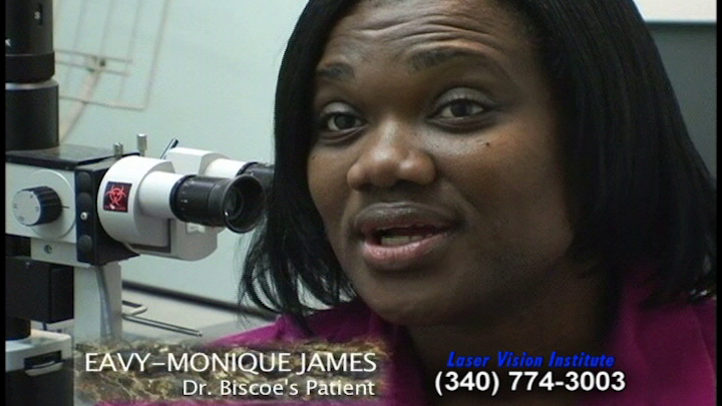 Patient Eavy-Monique discusses how a corneal transplant by Dr. Biscoe restored her vision. LASIK is one of the most common methods of laser vision correction. It requires a certain corneal thickness; those with thin corneas are likely better candidates for PRK. The procedure can treat nearsightedness, farsightedness, and astigmatism, benefiting many patients who desire independence from glasses and contact lenses. To begin the LASIK procedure, a small flap is created in the outer corneal layer. Next, an excimer laser is used to reshape the inner corneal layers. After treatment, the flap is replaced and the eye heals on its own without the need for stitches. The entire procedure generally takes only 15 minutes to perform. Custom LASIK uses Wavefront™ technology to precisely map, and treat, unique surface imperfections in the eye, in addition to refractive errors treated by traditional LASIK. Intraocular lenses (IOLs) are permanent contact lenses that are used to restore vision for patients who have had their natural crystalline lens removed due to cataracts. In the past, intraocular lenses could only correct vision at one distance. If patients had traditional IOLs to correct their long-distance vision, they would usually need to wear prescription glasses in order to see objects at close and middle ranges. However, ReSTOR® intraocular lenses are specially designed so that patients can see at all distances. ReSTOR® IOLs can greatly reduce or eliminate the need that many patients have for glasses after cataract surgery. We are the only practice in the Virgin Islands to use ReSTOR® intraocular lenses. Monovision refers to treatment that is performed to correct presbyopia, a reduction in the eye’s ability to focus. Presbyopia typically affects individuals over the age of 40. To see clearly up close, individuals with presbyopia need to wear reading glasses. LASIK surgery, intraocular lenses, and contact lenses are several of the monovision treatments that are available. In each treatment method, one eye is corrected for distance vision and the other eye is corrected for near vision so that the patient can see clearly at all ranges without the need for glasses. Our doctors can determine which solution is best for your needs. Dr. Biscoe is an expert in advanced cataract surgery techniques, including no-stitch and microsurgical methods. These techniques offer the advantages of a shorter recovery time, less discomfort, and fewer complications. Glaucoma is a leading cause of blindness in the United States, but if detected and treated in its early stages the impact of the condition can be greatly reduced. The disease significantly increases the pressure in the eye and can also damage the optic nerve. Dr. Biscoe uses several techniques to treat the disease and stop it from progressing, including eye drops, laser treatment, and surgery. UV exposure is believed to be one of the main causes of pterygium (tur-RIDGE-ium), a condition in which tissue from the outer membrane of the eye can grow onto the cornea itself. Pterygium often affects those who spend significant amounts of time outdoors in sunny climates. Symptoms include irritation, redness, and tearing. Occasionally, vision is obstructed and surgery is required to remove the excess tissue. Dr. Biscoe performs no-stitch pterygium surgery, an advanced technique that shortens recovery time and minimizes discomfort. Dr. Biscoe encourages all individuals to wear UV 400 rated sunglasses to help prevent pterygium growths from forming. Diabetic retinopathy is an eye condition that affects many individuals with Type 1 or Type 2 diabetes. The condition causes blood vessels in the tissue behind the eye to leak and expand. Dr. Biscoe uses either laser or delicate surgical instruments to remove the abnormal blood vessels. If diabetic retinopathy goes untreated, complications can result, including retinal detachment, glaucoma, and blindness. Regular eye exams play a crucial role in protecting vision and maintaining eye health. It is important to get your eyes checked at least once a year so that if glaucoma, diabetic retinopathy, or any other conditions arise they can be detected and treated before causing complications. Dr. Biscoe is pleased to provide comprehensive exams for the entire family. We are also able to fill new contact lens and glasses prescriptions at our full-service optical shop, which has a wide selection of fashionable, affordable eyewear. To help provide additional information about cataract surgery, Custom LASIK, intraocular lenses, and our many other treatments, our staff frequently sees patients from the U.S. and British Virgin Islands, Puerto Rico, St. Martin, Anguilla, and other locations across the Caribbean. To schedule a visit with Dr. Biscoe, please contact the Laser Vision Institute today.